Turkey isn’t just for Thanksgiving! Fire up your grill this summer and make this Greek Turkey Pasta Salad! This easy salad recipe is mayo-free and great for a BBQ! Unless it is Thanksgiving time, turkey is often overlooked as the protein of choice for dinner, but we are here to change that. 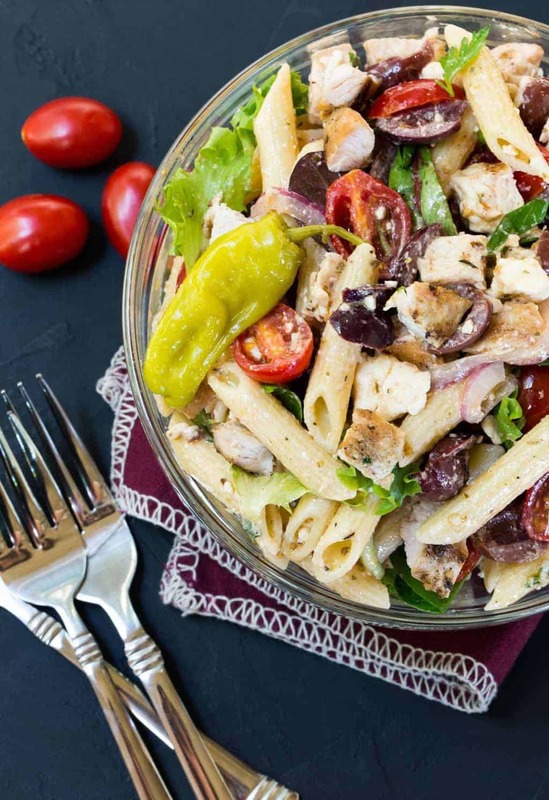 June is Turkey Lovers’ Month, and it’s the perfect time to fire up the grill for something unexpectedly delicious like this Greek Turkey Pasta Salad. This entree salad is great for summer BBQs because it is packed with all the fresh Greek flavors we love – tomatoes, olives, red onion and feta cheese. Add some grilled turkey tenderloin that’s been marinated with lemon and olive oil, and you have yourself a protein-rich entree salad that is anything but boring and everything delicious. Plus the addition of grilled turkey provides more than just great taste. Turkey is filled with rockstar immune-boosting nutrients like iron, zinc and potassium. Hosting a BBQ? 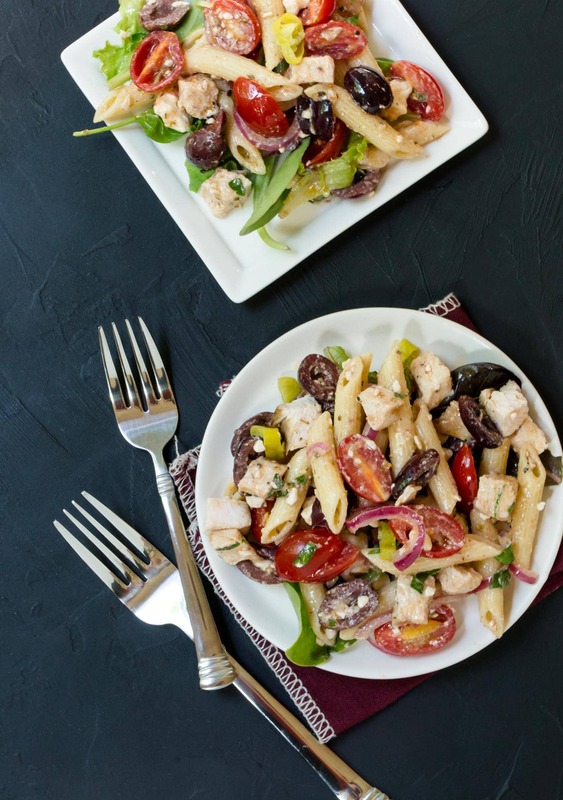 You can easily prep this Greek Turkey Pasta Salad the day before, but I suggest you wait to add the spring greens mix until right before serving to keep it crisp. Add a few other salads to the menu (like this Watermelon Feta Salad and Mediterranean Quinoa Salad), stir up a pitcher of a refreshing sangria and summer entertaining couldn’t be easier. Spray your grill with grill cooking spray before you place turkey on it to prevent it from sticking to the grates. Turkey will brown quickly. Always cook turkey tenderloins to an internal temperature of 165°F according to a food thermometer. Use tongs! Piercing the turkey meat causes flavorful juices to escape. Grill time varies! The size and shape of the cut of meat, the distance from the heat, temperature of the coals and the outside air temperature will all affect grilling time. Direct grill using medium-high heat for turkey tenderloins that require 25 minutes or less cooking time. Let the turkey rest before you dice it for the salad. This allows the juices to redistribute throughout the meat. Tip: Short on time? Use your favorite bottled red wine vinaigrette. No one will know and your salad will still taste delicious! Whisk the olive oil and lemon juice in a small bowl. Season the turkey tenderloin with salt and pepper and place in a resealable bag. Pour the olive oil and lemon juice mixture over the tenderloin and marinate for at least 30 minutes and up to 8 hours. Remove turkey from refrigerator 30 minutes prior to grilling. Preheat grill to medium high. Spray grill with cooking spray and place tenderloins on grill. Grill over medium high heat for 20 minutes or until internal temperature reads 165 on a thermometer turning every 5 minutes. Let meat rest for 10 minutes before dicing for salad. Place the vinegar, oregano, mustard, garlic, salt and pepper in a bowl and stir together. Gradually add the olive oil and whisk to thoroughly combine. Set aside until needed. Place cooked turkey, pasta, tomatoes, olives, and red onions in a large bowl. Pour desired amount of dressing over top and mix well. Add feta cheese and gently stir to combine. Right before serving, add spring mix greens to pasta bowl and stir to combine. Disclosure: This post was sponsored by the Minnesota Turkey Growers Association. All opinions are our own. Thanks for supporting the organizations that make Garnish with Lemon possible.